In Baton Rouge we make no secret that our user groups and our 578-person SQLSaturday combines the volunteers and attendees of our local PASS chapter with our neighborly Baton Rouge .NET User Group. It's not just SQL folks attending our monthly meetings and annual event. When discussing this, I've always been very honest and enthusiastic that holding joint events of local technical communities really works. We all joke that developers and database administrators don't get along. 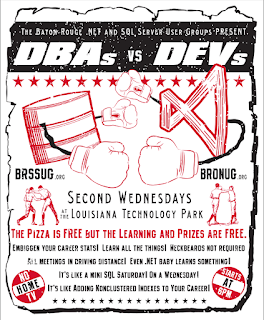 The playful banter back and forth between devs and DBA's in Baton Rouge is never mean spirited, and is actually embraced (see image to the right). I personally work with 20+ developers every day and enjoy the dialogue and camaraderie, at both a technical and social level. 2) increase the ROI to sponsors of monthly/annual events. If your SQL Server User Group isn't reaching a critical mass of folks at your monthly user group meetings or annual SQLSaturday events, reach out to your .NET group. They might be in the same boat. Gaining a critical mass of attendees is important. That doesn't mean they all have to do the same job. That critical mass of attendees each month makes the room feel full, it makes folks want to invest in becoming a technical speaker, user community leader, and recruiter for future user group attendees. IT professionals are far more likely to recommend to their friends and colleagues a meeting that monthly gathers twice as many people. 6:15pm: Introduce the user groups and each group's leadership. Give out announcements about upcoming events applicable to both groups, facility information, etc. 6:20pm: Announce the sponsor for the meeting. (Thank them for the pizza!) If present, the sponsor can give a demo or a talk or a giveaway. Also allow for your host facility, whatever it may be, to talk briefly about their mission/purpose as well. In our case, the Louisiana Technology Park sometimes sends us a representative (or CEO!) to give a short pitch on what the Tech Park does and the kind of companies they foster. 6:30pm: Sometimes, a member of the user group will give a lightning round (10-15 minute presentation) on a topic that applies to both .NET and SQL crowds. Past examples: SQL Server Reporting Services, Power BI, source control, professional development, communication skills, tools and utility applications, Visual Studio tips and tricks, security, cool upcoming tech gifts for holiday shopping. 6:50pm: Once separated, sometimes each user group will have its own Lightning round and announcements. 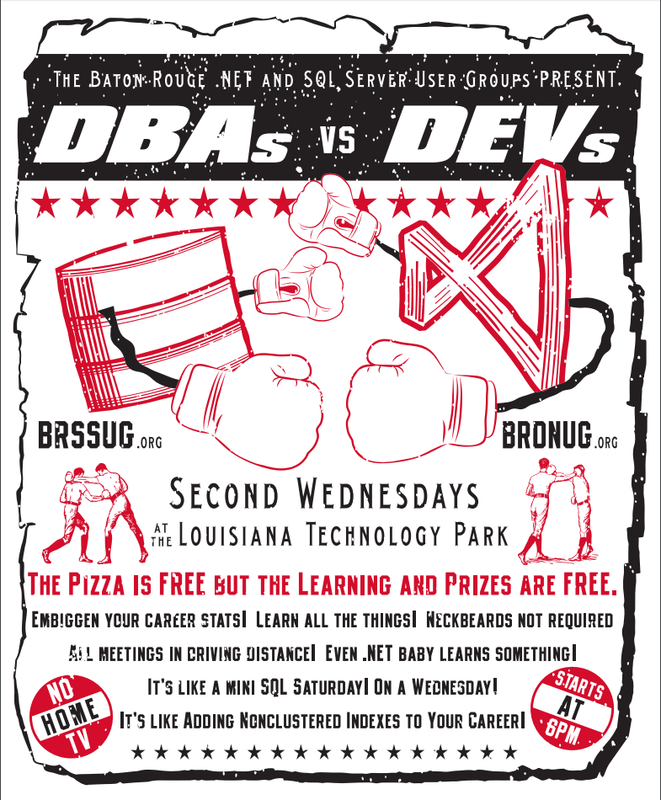 For example, the Baton Rouge SQL group shows the monthly PASS slidedeck now, not to the combined crowd. 8pm: The crowd gets back together in the big room for raffle giveaways, see-you-next-time, more professional networking. 9pm: Usually, folks are still networking and chatting in the facility by the time we need to kick them out! Sometimes, they'll continue the tech talk and networking at a nearby bar or restaurant. You may find that technology professionals will attend your joint SQL+.NET meeting, then decide which one to attend based on the topic. Many .NET coders know and work with SQL Server, and vice versa. In practice, we very rarely hear the complaint that they cannot attend both meetings. It hasn't happened in recent memory. User group presenters frequently make their presentation slidedecks available for download after the fact, or have the content recorded otherwise. Attendees can still visit with presenters from both presentations, regardless of what room they choose. Find a two-room venue, typically with one big room and one smaller room. Already have a meeting venue for your monthly meetings? Ask if they have another room you can use. Reach out to universities, specifically the alumni coordinators or faculty members who are interested in connecting students with professionals in the field. Ask for a consistent, scheduled-in-advance location, don't get moved around every semester, it will hurt attendance. Reach out to technology parks or incubators who cater to tech startups - tell them that your attendees are their target audience for future startup tenants. Reach out to local consulting firms or training providers who have conference rooms in use during the day but vacant at night. Reach out to local Microsoft offices or facilities. Don't get caught up in leadership competition, don't propose merging the user groups or taking away group sovereignty. That's not the idea. Figure out which folks among the user group leadership can emcee the meetings, remembering that it doesn't have to be one person. Recruit sponsors using the edge that you have a wide audience of technology professionals on the front end and back end of application development. Consider sharing finances between the two user groups for the purpose of user group sponsorship and supplies instead of splitting the sponsorship income and the food bill and arguing over "who pays for who". This is very similar to a marriage. :) If one user group has already incorporated as a not-for-profit, this means the other group doesn't need to go through this expense and hassle to enjoy the benefits. Order more pizza :) and drinks, make sure you have space and supplies to serve more folks. Combine resources when it comes to bulk purchases of cups, paper plates, napkins, etc. You don't have to combine main topic presentations, but sometimes it's possible. We've had the SQL and .NET groups stay together for topics like Database Performance tuning for Entity Framework, or SQL Server security and permissions. Host everyone-invited events like Networking Nights, Speaker Idols or Holiday Parties, where multiple speakers from both groups can give soft-skills, non-technical or highly-entertaining presentations, or no presentations at all. Our Networking Night is the July meeting preceding our annual SQL Saturday event in August. It's our largest meeting every year, features short-format (<10 minute) entertaining presentations on career topics. It's part of the SQLSaturday sponsorship package too, giving a Career Night speaking opportunity to Gold and Platinum sponsors. Our Speaker Idol nights are entertaining and informative "competitions" where speakers create short (<10 minute) demos or "tips and tricks" presentations. "Celebrity judges" can include local CIO's or IT professionals who are witty with a talent for giving constructive feedback, congenial heckling and creating a fun, positive atmosphere. Add and recruit .NET tracks to your local annual SQLSaturday and ask .NET UG leadership to help recruit and select speaker sessions for the event. Expanding your tent can attract more folks, helping the event get a critical mass of attendees and greatly increasing the ROI for sponsors. Adding a partner group your PASS Chapter is not just for .NET by the way. You may find a lot of topical crossover and technical interest with a local Windows Server, PowerShell, virtualization platform, or IT Pro User Group, or perhaps with a SharePoint user community. Regardless, reach out to leadership of other user groups and introduce yourself. At your user group meetings, evangelize for other groups in the area, even non-Microsoft ones. In summary, try reaching that important critical mass of attendees by making a bigger, wider tent. Yes, this will have much more appeal to sponsors, especially recruiters and staffing agencies, and this isn't an insignificant reality. If you'd like to discuss this more, please do not hesitate to ask via Twitter, LinkedIn or the comment section of this blog post.